After 5 years of managing the salon and working with my clients, I decided to develop a product dedicated to helping my clients solve the problems of thinning hair and aging skin and nails. I worked with a pharmaceutical company to develop an organic supplement for healthy skin, hair and nails. Finally, after 3 years of hard work, FOLLIGENIX has arrived. FOLLIGENIX is a unisex dietary supplement that contains a proprietary blend of organic ingredients that have been shown to work wonders in revitalizing skin, hair and nail health. As a pioneer in the hair and beauty, I wanted to branch out on my own and develop a product that would not just treat hair issues from the outside, but from the inside out. I firmly believe that you need to commit to a healthy lifestyle that includes proper nutrition, exercise, sleep and hydration. In addition to treating your hair with superior products, research shows that proper supplement intake in addition to a healthy lifestyle will support the health of your hair and reduce the occurrence of thinning hair and hair loss. Click here to learn more or purchase Folligenix. 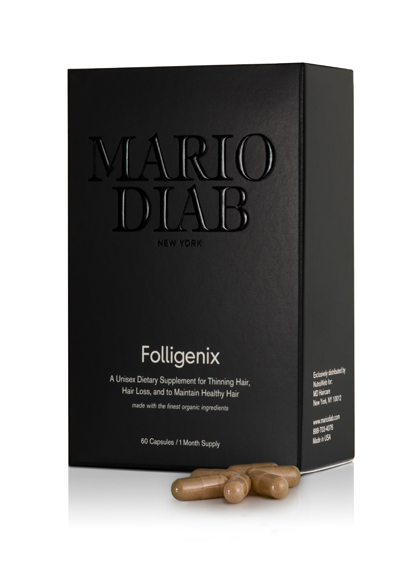 This entry was posted in Beauty, Folligenix, Hair care, Nails, Skin Care, Wellness and tagged beauty supplement, Biotin, folligenix, hair health, hair loss, Healthy Hair, Healthy Hair Tips, mario diab, mario diab salon, nail, nails, skin, skincare. Bookmark the permalink.